Construction of the new entrance to Filippello Park on the Grove Street side is nearly complete. The picnic tables are part of the new green space near Grove Street and the blacktop will have basketball, futsal and pickleball courts. 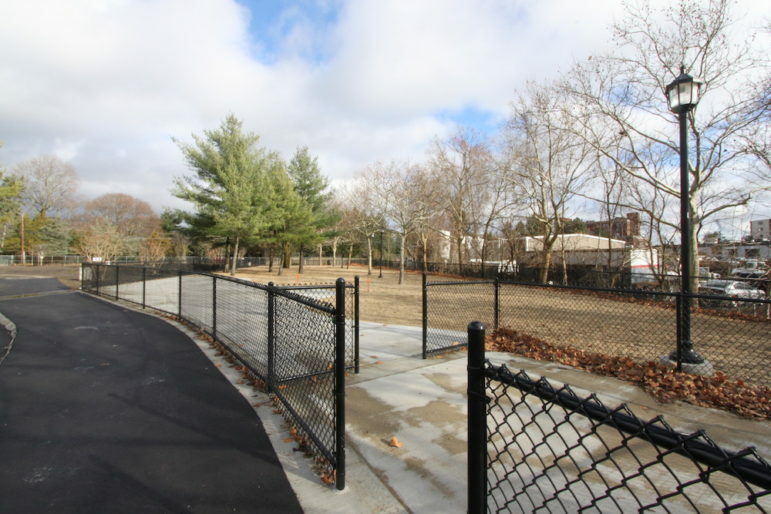 Planning for the renovation of the Grove Street entrance to Filippello Park began six years ago, and discussions for what to do with the section of the former Watertown Landfill date back to 1984, so Recreation Department officials are excited to that construction is nearly complete. The area used to be the location of the incinerator at the landfill. 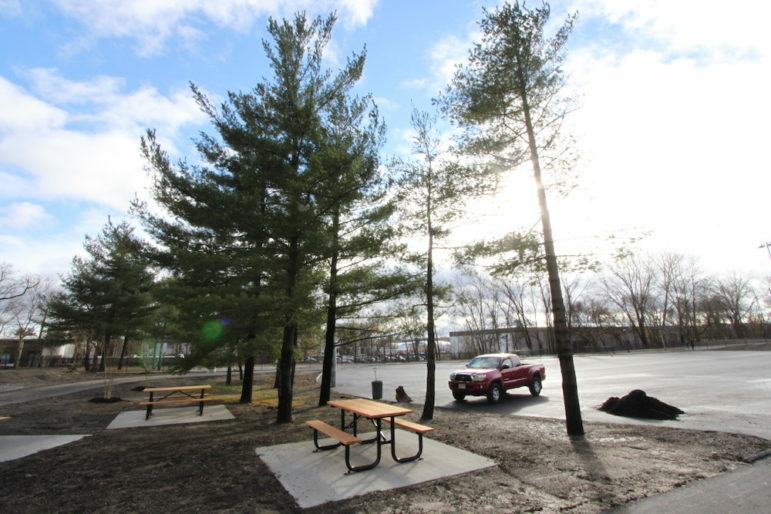 While the rest of the land was turned into Filipello Park, the property near Grove Street had largely been paved over and used for parking, basketball courts and, in the winter, the Town’s snow dump. Recently, Recreation Director Peter Centola met with Glenn Howard, project designer from CDM Smith to go over some of the last details in the project. Discussions about how to reinvigorate the area began in 2012, Centola said, and morphed over the years. The Grove Street entrance will have a large dog park, two gazebos, a hard court playing area, and additional parking. 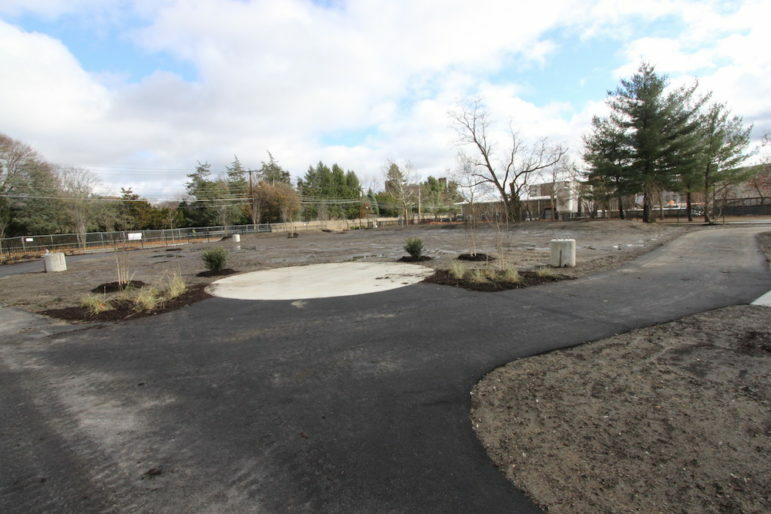 The fences that enclose the dog park area can be seen, and the new driveway and parking area, have been paved. There is also a new green area right at the entrance of the park. The fences surround what will be the new dog park at Filippello Park. There will be areas for small and large dogs to roam off leash. The project covers 22,000 sq. ft., and will cost $1.28 million, Howard said. Construction began on July 15, and Howard hopes it will be largely done by late December. The contractor on the project is Heimlich Landscaping & Construction. Still left to be completed will be the surface of the hard courts, which Howard said will be done in the spring. It will be lined for basketball, futsal (a variant of soccer), and pickleball, which is sort of a cross between tennis, ping-pong and badminton. Also remaining is the installation of street lights powered by solar cells that will to along the new driveway. Solar lights were used because officials did not want to dig into the ground for fear of exposing contaminants, Howard said, so an electrical conduit could not be buried underground. The drive is on the opposite side of the property from before construction. Centola said the idea to do that came from Public Works Superintendent Gerry Mee. The landscaping has not been completed, but the area will become green, open space near Grove Street. The reorientation allowed space for the large new dog park, which will have separate areas for large and small dogs. Inside the dog area, there will be benches and a water fountain with a bowl for dogs and a spigot for humans. The dog park was a relatively recent addition to the project. It was brought up by members of the Dog Park Task Force a few years ago, Centola said. Centola said the project could not have been completed without the help of the Conservation Commission, which has jurisdiction over the land. Down the line, Centola would like to make more additions to Filipello Park, including replacing the current lights at the softball field, and adding new lights for the field closest to Arlington Street.